Riddle: what do you get when you combine wind storms and trees weakened by a beetle infestation? Answer: Work that never ends. 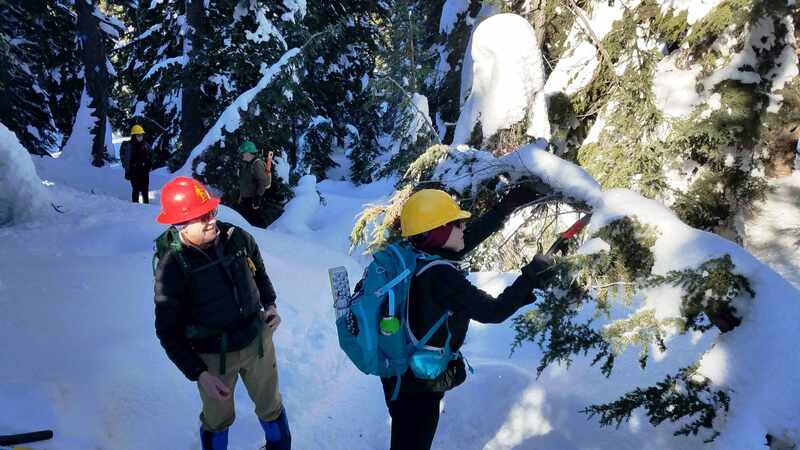 Heavy winds blew over trees in the Cascades around the holidays. 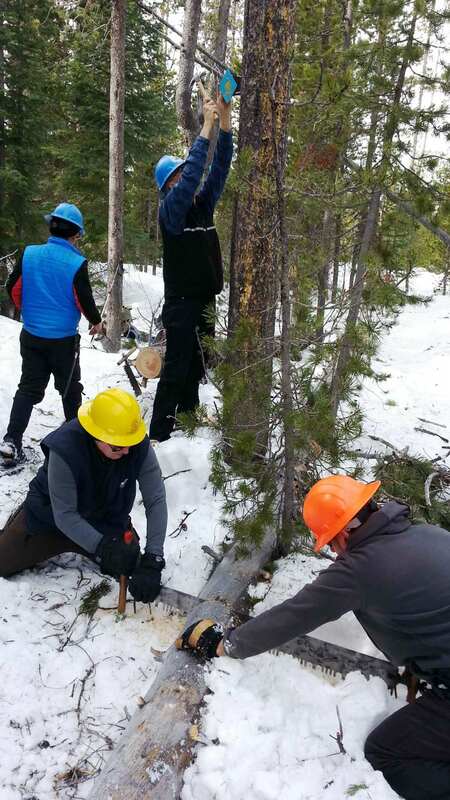 So Central Oregon Nordic Club volunteers headed into the woods with saws to clear ski and snowshoe trails and replace missing trail-marker diamonds. Then they had to go right back out after high winds hit the area again during the second half of January. “Wish the wind would blow before, rather than after, we post that the trails are clear,” jokes Bob Timmer, who leads a group of volunteers that head out weekly to do maintenance on snowshoe trails. 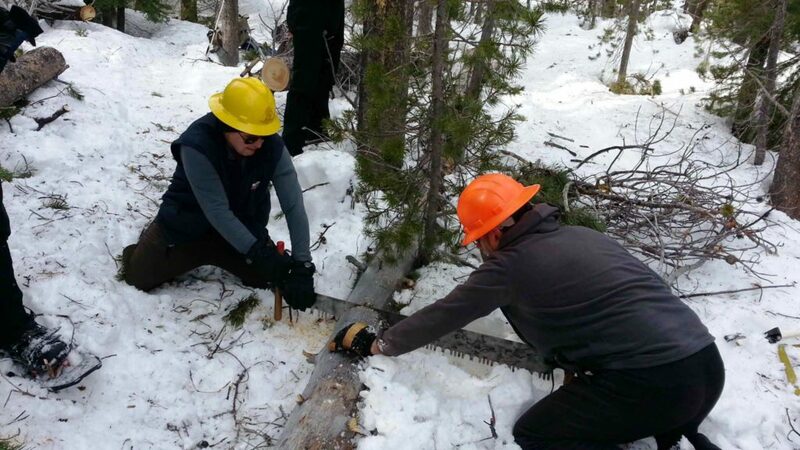 On Monday, Feb. 4, volunteers worked at Edison Sno-Park. They started their day by heading out on the Tesla trail and completed clearing of a large log at the intersection with snowmobile trail No. 3. 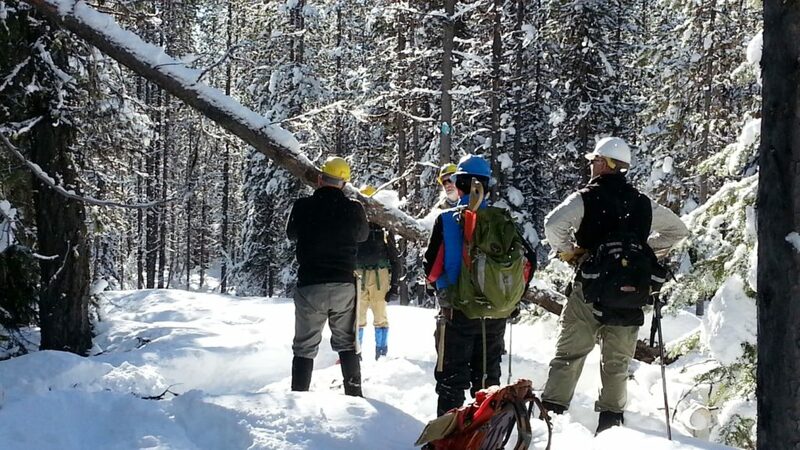 Over the course of the day, the workers also cleared six more blowdown trees. One late-January day, workers headed out of Swampy Sno-Park to cover the Long Loop snowshoe trail to the Nordeen tie, then to the Nordeen shelter, then to Meissner Sno-Park. They removed a dozen blowdown trees from the trails and hung two assurance-diamond trail markers. A few days earlier, 16 blowdown trees were removed from the Porcupine snowshoe trail. Another day, they did the first sweep of the winter headed west on the Tesla trail from Edison. 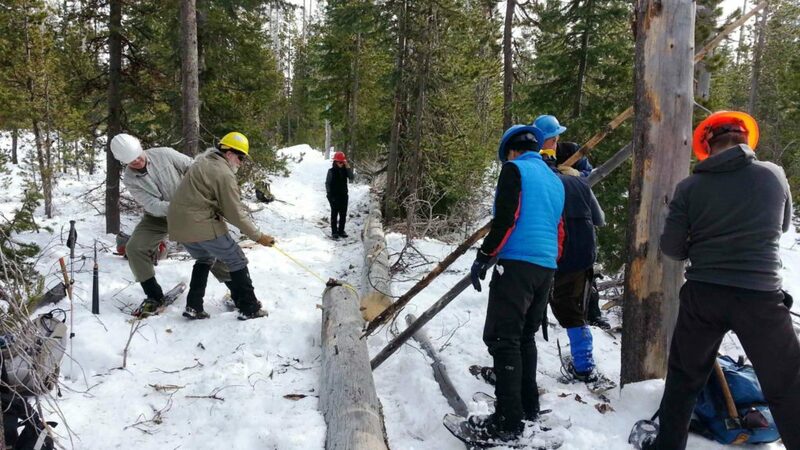 The trail was still in good condition from the summer-clearing effort, Bob reports, but workers still had to remove six blowdowns and hang one bracketed diamond trail marker. Workers who joined Bob on some or all of the snowshoe trips included Dennis Delapp, Jim Elliott, Dave Alward, Pat Moen, Mathieu Federspiel, Mike Bodel, Chuck Delcambre, Gary Evans, Dave Alward, Desi and Charlie Vial, Dan Murphy, Al Matson, Mike Bodel, Mike Maidl, Chuck Delcambre, Pat Moen and John O’Donnell. 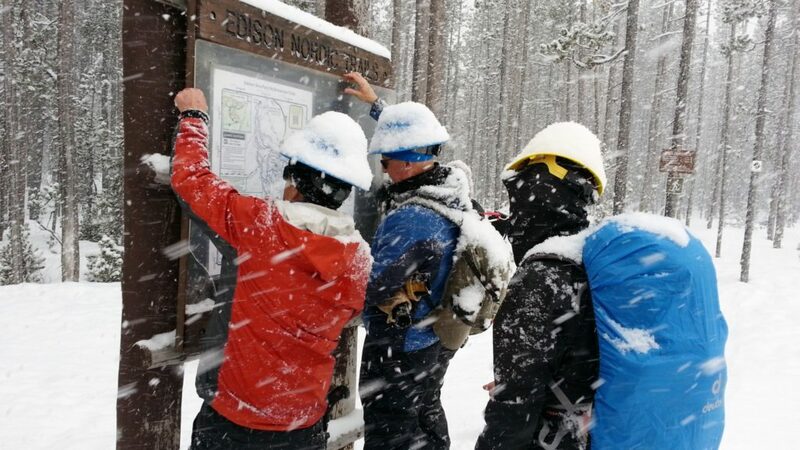 They were joined on one of the outings by Jessie Larson, the Forest Service trails team and volunteer coordinator.